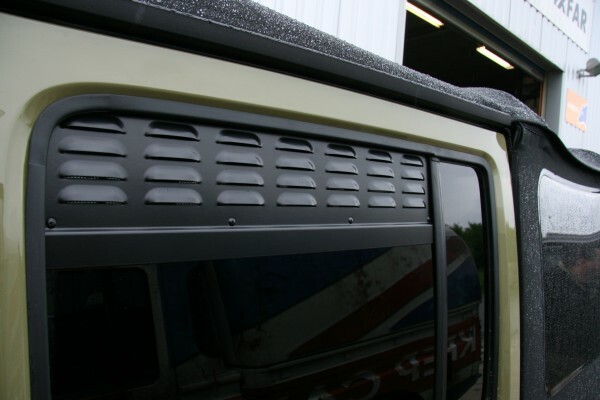 I made a couple rear window vents for my JK Unlimited to get air circulating while sleeping in it, yet not let in the rain or bugs. The basic idea would work for any rig with relatively square window openings. Nakatanenga's appear to be a quality product, but I wanted something a little bigger (for more air flow). If you're interested in those, someone on Expo Portal found that one of their employees speaks english and will setup a paypal transaction for you. Last I heard they were running about $80 shipped to the US for a pair. Email Melanie at melanie@nakatanenga.de to order. I went cheap and easy for the first version by using simple 1/4" thick black corrugated plastic. If they work out well but prove too flimsy, I'll probably re-make them using some 1/8" Lexan. The actual vents are $2.50 aluminum attic vents from Home Depot (with the roofing stuff near the lumber section). They have 2 other heights available as well. They have a mesh, but I added better screen with smaller holes to keep the mosquitos out. I used a putty knife to fold back the edges where the existing mesh was tucked to add in my screen. Everything is simply stuck together using 3M exterior 2-sided tape. It's the same stuff used to hold moldings and trim on your car, so it's actually pretty durable. Some Z-channel aluminum strip was used on the lower edge to create a drip-rail that overhangs the window glass. Besides weather-proofing the setup, this helps hold it in place against the glass. To use them, I simply roll the rear windows down 3/4 way, slide these in and leave them resting down against the glass, then roll the windows up till these guys tuck into the top channel... takes all of 30 seconds! I bought everything for this quick project from Home Depot and I think it was about $40 worth of stuff. However, a third of that was because I bought their best roll of screen (smallest holes to keep out the gnats). If anyone nearby needs some screen, I've got a giant roll now! The first use will be this weekend on the Rug Road trip! Very interesting. We also use just the skeeter beater screens for now. They are very nice Kris! Good Job! the vents worked great! there was plenty of air movement, they installed/removed quickly, and tucked away easily when not in use. the only advantage to these over the skeeter beater idea would be if it rains during warm weather. we don't see rain too often on trips here in the SW. but if it does pour these should keep me from having to sleep in a sweltering stuffy rig. for the simplicity and cost, i think it's a worthwhile upgrade from magnetic or sock-style screens. in fact, i liked them so much that i'm going to go ahead and make some out of a sturdier plastic. that was the only issue with them really - i felt like i had to be very careful to not crush the flimsy corrugated plastic when putting the windows up to hold them in place. Last edited by theksmith; 11-11-2016 at 11:48 AM. These are awesome!! Great idea! i finally got around to re-making these out of some ABS sheet and pop-riveting the vents on so everything is more durable. 2 sheets of 1/8" black ABS cut to the right size were only $10, but shipping added another $8. i found that using a jigsaw with a coarse-tooth wood blade worked well, especially if you barely pull the trigger and let the blade move very slowly while still pushing the saw forward at a normal pace (i.e. let it bite large chunks). otherwise, the ABS just melts itself back together. Where in HD did you get the Z channel? Was it with the loose metal? I did a cursory look for it but figured I could probably find it online, but I haven’t found it cheaply. that z-channel was either back near the screen door material and weather stripping stuff or over in the tile edging area. it's very thin, the only place i've seen aluminum Z-channel online was pretty expensive with shipping. but we usually have great weather in the Southwest and so more often i just use some $10 mesh nets. they are quicker to deploy and let more air in. these are the ones i bought... i'm not sure why there are some bad reviews, i've been using them for nearly 2 years without a problem. if you get something like that make sure you get tall version (around 22+ inches) instead of the car window height. i know a couple people that use Skeeter Beater brand and are happy with them as well. those mount on the outside with magnets that are sewn into the mesh.